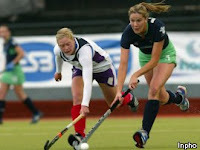 Irish Coach Gene Muller includes 5 uncapped players in his 27 woman squad to play Australia later this month: Holly Moffett, Christine Quinlan (both UCD), Ali O’Connor (UCC) Niamh Small (Lorteo) and Stephanie Quinn (Armagh). This series is part of the build-up for next April’s Olympic Qualifiying tournament. The series will not count as capped matches.